DP - What is it? How to use it effectively! 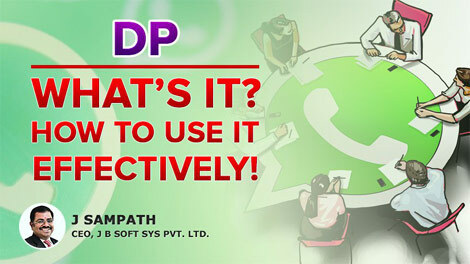 What is a DP - Display picture, it is an image, the one you set in your profile for Facebook, WhatsApp, LinkedIn or any public profile. What is the use or purpose of a DP - Display picture. Just to quickly recognise you, though they see your name in text as they saved in their contact book the visual impression of you helps others to recognise you faster. We see many DPs as people keep their loved ones, children, spouse, parent; Some keep places, some keep logos, some keep even flowers as DP and many do not have any DP too! As we are in business, we use WhatsApps for communications, it is always good to have your face, which is easy to recognise by others and chances are they act on the messages faster. Though the organisation logo also can be used as DP, I suggest to use your good face image as DP. Many keep changing the DPs regularly to occassions and set some other’s image as their way of showing respect to that day or to the person they revere. It is a good idea to keep a constant DP image, let your single good impression of you occupy the mindshare of your contacts, for being efficient and effective in your reach, DP matters.